Located in the center of Roslindale Square, Suya Joint, opened in February, is small and sparsely decorated. Photographs of baobab trees on walls and pictures of lions over the host stand let you know you are in an African restaurant. You’ll also see signs asking you to keep your conversation from getting too loud, which seem out of place early in the evening. As it gets later and groups of men come in to eat, drink, and catch up, the energy gets more lively and fun. It may take you a while to get noticed here. We had the same sweet waitress on multiple visits, but when she isn’t in the room, the rest of the staff isn’t too concerned with guests standing awkwardly at the door, or sitting at tables without menus or water. And while the food may take a while to arrive, most of it is worth the wait. The menu can be a bit intimidating if you have never eaten Nigerian cuisine. Our waitress is happy to walk us through the ordering process. Based largely on starches, such as beans, plantains, and black-eyed peas, and stewed meats, meals are “like a Sunday dinner where you want to just kick your feet up after,” she tells us. Suya, the restaurant’s namesake, is skewered meat with a flavorful blend of spices, including cayenne, thyme, and ground peanuts. 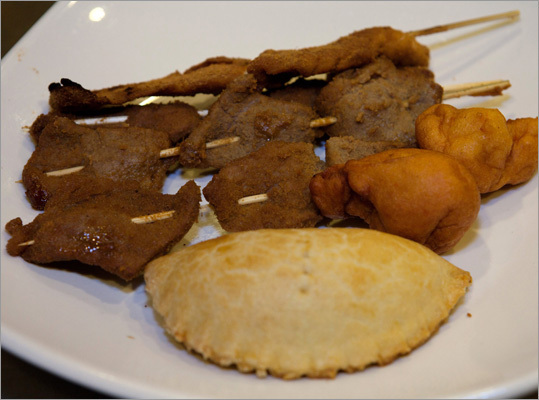 In the Joint sampler ($10.50), we try both the chicken and beef suya,along with flaky, flavorful, ground-meat hand pies, and akara, which are like little munchkin doughnuts made with a blend of black-eyed peas, peppers, and onions. Taushe ($10.50), one of the best dishes we try, is a slightly spicy peanut stew that we slurp up with its accompanying yam fufu, a large dumpling that arrives in plastic wrap. You rip off a piece and fashion an edible spoon to soak up all the yummy broth. Fufu comes in your choice of cassava, pounded yam, farina, oatmeal, or rice. To go with vegetable stew ($13), we chose cassava fufu, which has a slightly granular texture. Surprisingly, the vegetable stew has a strong ocean flavor that seems like it doesn’t belong here. Nothing is off, just unexpected. Chef and co-owner Cecelia Lizotte later tells us it contains smoked fish and fish stock. Oxtail pepper stew, a rich spicy broth with meltingly tender tail meat ($8.75), gets raves. Fish pepper soup ($7.75) is a little muddy. Unfortunately, the beef that comes with otherwise delicious jollof rice is so tough it’s practically inedible. But the rice, with its spicy red pepper, onion, and tomato flavor, is a standout. Another night the beef in the same dish is less tough, but certainly not tender. All rice and bean dishes come with a choice of stewed beef or chicken. With beans and plantains ($8.50), we try the chicken, which has a good flavor but is stringy. Plantains are crispy, caramelized on the outside, sweet and creamy within; black-eyed peas are outrageously good — spicy, tender, and addictive. We could happily make a meal (or two) with just the beans and plantains. Suya joint is still working out some kinks. But no matter where you are from, you know homestyle comfort food when you taste it. This is food to share with friends, food that gets your hands dirty, food to wash down with a couple of Tusker beers. When you look around and see groups deep into conversation and laughter, happy to be in one another’s company, you’re getting a slice of Nigerian culture on the side. 617-327-8810, www.suyajoint.com. All major credit cards accepted. Restroom not wheelchair accessible. Prices Appetizers $5.75-$10.50. Entrees $8.50-$13. No desserts. 11 a.m.-8 p.m., Fri-Sat 11 a.m.-10 p.m.
May we suggest Joint sampler, taushe with pounded yam fufu, oxtail pepper stew, beans and plantains, jollof rice.